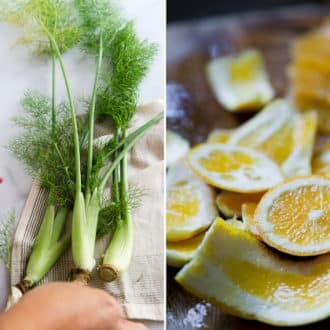 There’s an obvious cult happening all over the internet and home kitchens. All the wonderful and cute blame goes to adorable Angie at Bakerella. 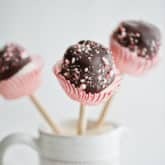 Honestly (and unfortunately) we didn’t discover the world of Bakerella and Cake Pops until we met Angie at our last Food Blog Forum seminar in Atlanta. There was an energetic buzz around Angie and her fans were clasping to her new book, Cake Pops, like it was the hottest new toy in the food world. After having the pleasure of meeting Angie and seeing all the wonderful excitement over her Cake Pops, we’re happy to finally understand all the exciting buzz and thrilled for Angie’s success. Cake pops (and Angie) are so cute. cute. cute. Her little cake pops always leave a permanent smile on our faces. It’s so amazing to see how much personality can exist on a stick. And best of all, it all looks so much fun. 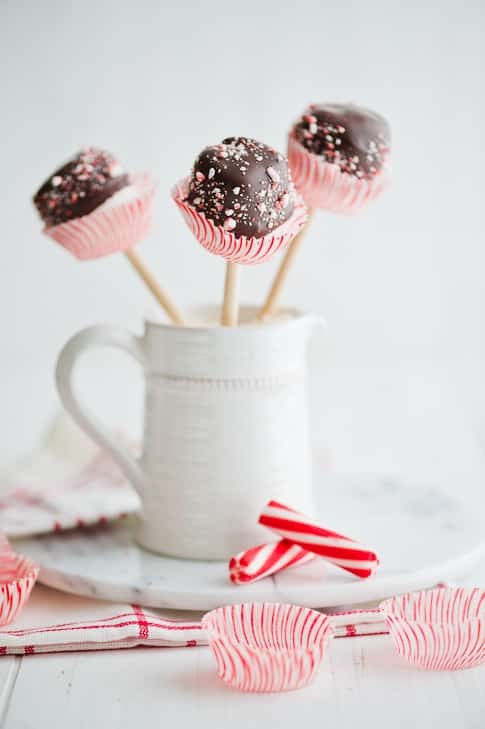 With bags of marshmallows purchased for holiday fudge and a bunch of chocolate left over from our last cookbook shoot, we immediately thought of Angie and her cake pops. These marshmallow pops aren’t made of cake, but the inspired and amazing idea of Angies little cake pops and the spirit of sweets on a stick had us playing around with what ingredients we had in the kitchen. So chocolate mallow pops started appearing everywhere in the kitchen! These are so easy and fun to make. It’s hard to stop because the possibilities for these pops are so versatile. Anyone who like marshmallows, chocolate and candy will have a new sweet toy to eat and pass out to all their friends. An added bonus to these marshmallow pops is that they make great gifts. Wrap them in cellophane or stuff them in a gift box, these chocolate dipped marshmallow pops will make everyone feel like a kid again! crushed candy canes, maybe try green ones for more color! finished! 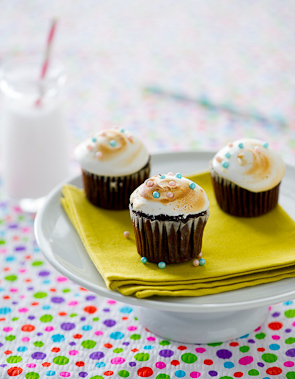 decorate w/mini cupcake paper from Sur La Table! 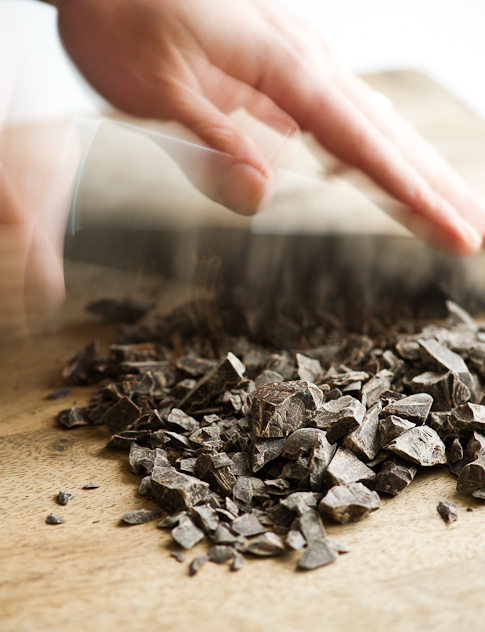 There as several ways to temper chocolate, but seeding is super easy and our preferred method at home. You can always buy and melt coating chocolate if you don't want to deal with tempering, but it isn't difficult once you try it a few times. Go for the pro! Temperatures for tempering are for dark chocolate. If we did milk chocolate I may be disowned by my dark chocolate loving mother ;0. If you must use milk chocolate or white chocolate, the initial melting temp point is 110°F and drop a few degrees off of the other temperatures. 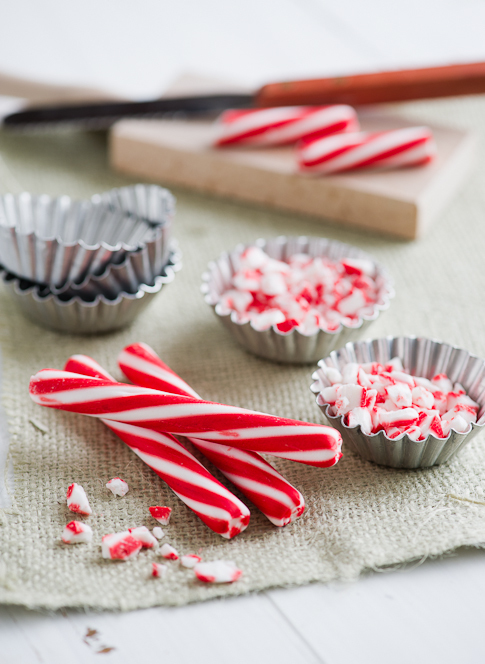 Have crushed candy canes set aside in a bowl. 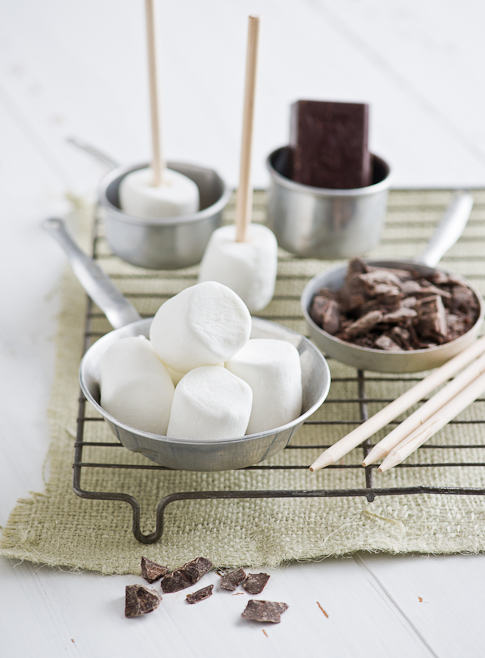 Set aside a container with uncooked rice or beans to hold dipped marshmallow sticks after you are done dipping. 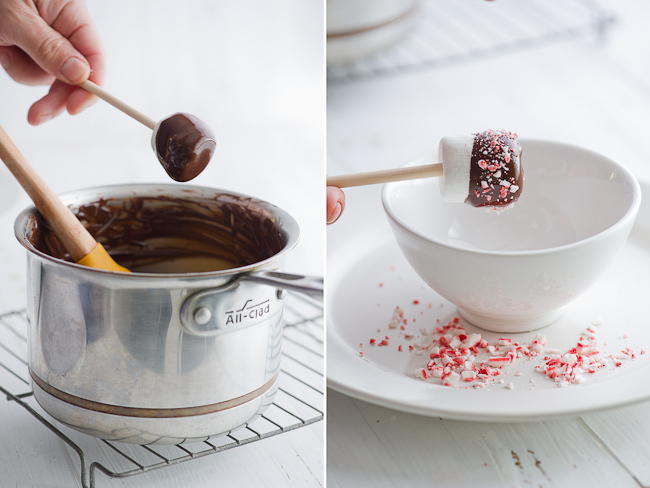 Skewer and dip the marshmallows into the chocolate covering the marshmallow as much as you like (we like the 3/4 dip the best) then before the chocolate hardens, sprinkle crushed candy canes onto the pops. Set aside in your rice or bean filled container to set. These are gorgeous and I bet delicious. I cannot wait to make them for Christmas! Bakerella is the queen of all pops! Seriously, she got us all hooked on making everything in the form of pops. This is super easy and fun! I might steal this chocolate-covered marshmallow pops for my niece’s birthday celebration. yay! i found a cute one 😡 promise. OMG!!! 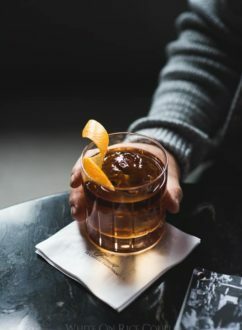 set these on the table when guests are over…stir them up in a cup of fresh brewed coffee…great conversation…and that’s what I call a good time! Adorable!! I can taste the sweetness just by looking at the pops! Whoa! I have a gigantic crush on these. These are about the cutest dang things I’ve ever seen. what a great idea! love the matching baker’s twine and cupcake paper too! 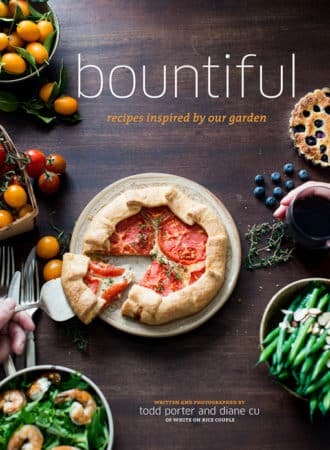 Can’t believe I missed the blogger here in Atlanta..been cooking too..love the pops idea, would be great for kids for Christmas party..or summertime w/ colored sprinkles..no running. With all that’s happed here since Thanksgiving still managed two large Tiramisu now in freezer and three containers of mac and cheese…and wonder who I think will eat all of the things I make..but did miss the Atlanta bloggers but excited about the Mexico Blogger Camp! This looks like an amazing holiday personalized gifts. Super cute 🙂 I love Bakerella’s cake pops! So fun! Great amazing photos!!! Great idea for Christmas gifts! aww they’re adorable! What a great idea! You guys are so cute. 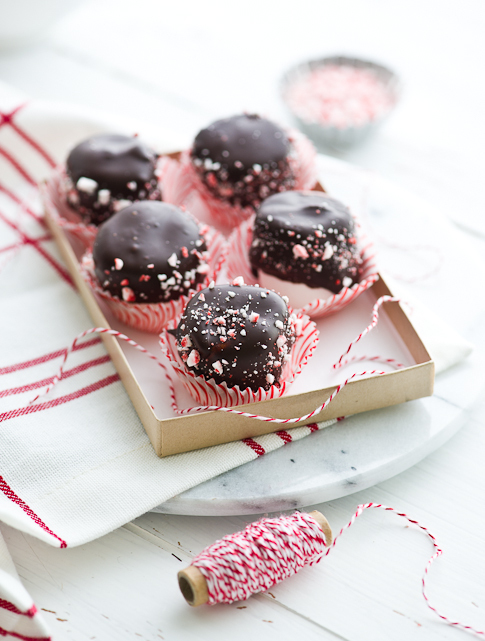 These are perfect for a holiday treat! What a STUNNING blog!!!!!! 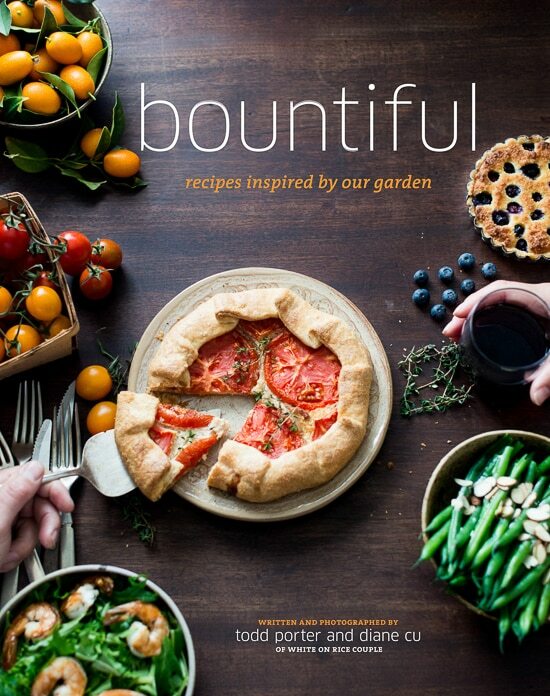 I love the food styling and photography!!!!!!!! I love the way you’ve styled these. So cute! I made homemade marshmallows last year, dipped in dark chocolate and sprinkled with peppermint and gave them out as Christmas gifts with a pouch of homemade hot cocoa mix. It was a huge hit! Me either – cake pops are not something I have the patience for! Those pops look so great. This does seem to be a baking sensation. 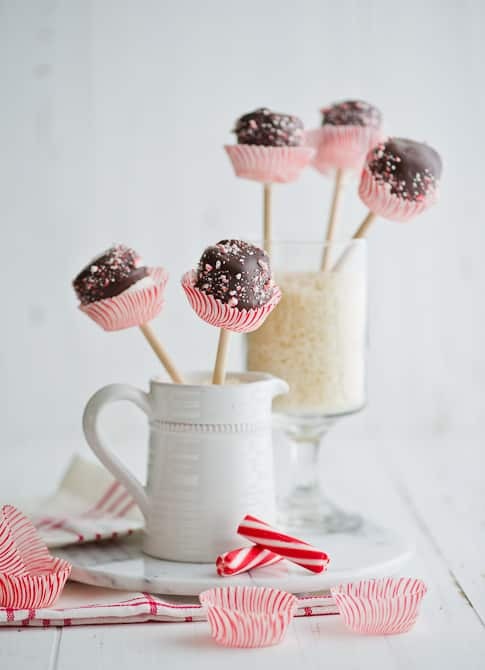 adorable little treats… how cute is that twine… i just did peppermint brownies~ can’t get enough of chocolate and peppermint… so good! Fantastic work guys, the photos are perfect, there’s no other words to describe it ; and the attention to details in the styling and propping makes even marshmallows look elegant. Gonna try this at home for my kids, sure they’ll love it. I love, love, love a good chocolate covered marshmallow and I am sure these would be no exception! However, your photos are CRAZY, good! You two continue to inspire me! Love it, Love you guys! Brilliant idea. Always inspired by you guys – simple, fun, sophisticated and beautiful! The whole family will be making Bakerella’s Cake Pops on Christmas Eve as a craft project . . . all 14 of us . . . in one room . . . with cake . . . and frosting . . . and sprinkles . . . pray for us! These are so adorable! Great gift for the holidays! I feel like I’ve just stepped into the North Pole and been wrapped in Christmas magic! LOVE these! Absolutely darling! These are so darn cute! My boys would go crazy for these. Where in the world did you find that peppermint striped string? Dara- these are by Martha Stewart and we bought them at a speciality paper store. But you can find the same string in big rolls at Crate and Barrel! We saw them there last week. 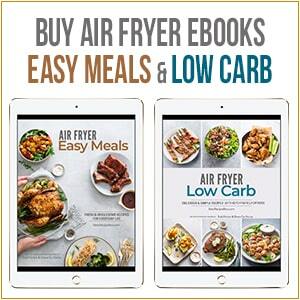 My girls would go absolutely nuts for these…I think I see a weekend cooking activity in our future! The presentation is lovely–who wouldn’t be excited to receive these? 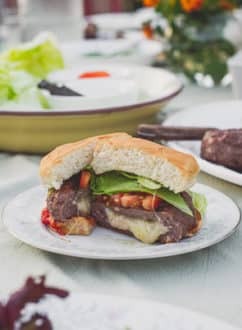 I have several friends who are gluten-free, and this recipe would be perfect for them. You guys rock! This would make a great holiday centerpiece! Just love this idea. They are so cute. your marshmallow pops look terrific! great photos!! These are so adorable! My daughter will love these! These are such a cool idea! And does anyone else think these marshmallows would be *perfect* for making s’mores? Then both your marshmallow gets toasted and your chocolate gets melty? Geneva- we made smores on a pop already too! 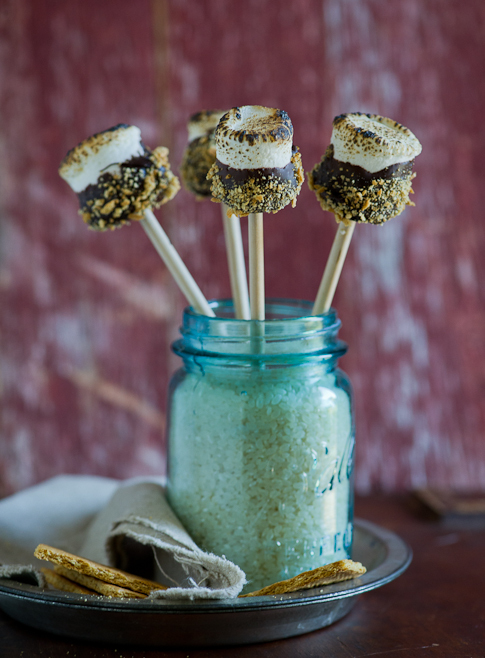 We’ll be posting our smores pops on Wednesday, check back for more! Your photos are so sweet ( haha! no pun intended….seriously). I love the playfulness and how these images just *pop*. They look like so much fun to make…I’m going to skip the gingerbread house this year and make these with my kids instead!